Rocky Mountain Spotted Fever is an acute infectious disease that is passed to a human by a tick bite. The pathogenic agent that is transmitted by the tick is a species of bacteria (Rickettsia rickettsii). This disease is most common in the South-Atlantic region of the United States and is carried by two kinds of ticks (the American Dog tick and the Rocky Mountain Wood tick). 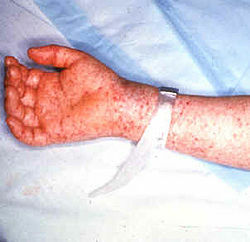 Rocky Mountain Spotted fever should be treated within the first week of symptoms. If anyone waits longer, then it becomes fatal. This disease is normally treated by antibiotics, which include tetracycline ,chloramphenicol, or doxycycline. For adults these antibiotics are given in 100 mg doses every twelve hours and children, or those under 100 pounds, are given the antibiotic in doses of four mg/kg every twelve hours. The treatment for this disease lasts for about five to ten days, and patients receive basic antibiotics and have to wait it out at home or in the hospital. 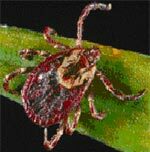 After getting this disease you can run the risk of getting it again, only because a tick can bite and have the disease again. People should just prevent any ticks from biting them. This page was last modified on 13 May 2014, at 22:12.